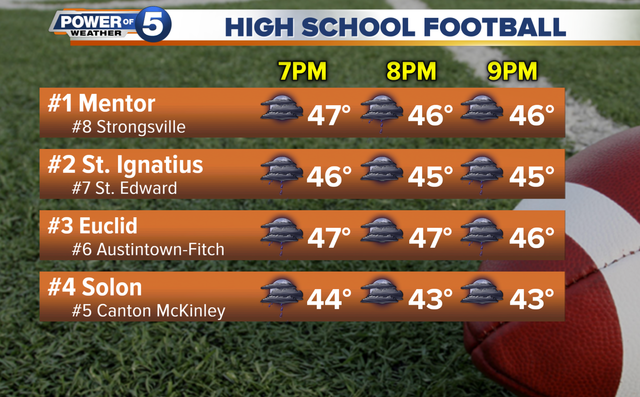 What will the weather will be like for high school football game playoffs? As high school students and parents pack the stands at local high schools for the much-anticipated playoffs, the rain has a possibility of making an unwanted appearance Friday night. Throughout the day, there will be spotty afternoon and evening showers with some late day clearing in southern locales. It's not the best night for football, but there will be more dry hours than wet. Mentor vs. Strongsville at Mentor—7 p.m.
Solon vs. Canton McKinley at Solon— 7 p.m.
St. Ignatius vs. St. Edward at Byers Field in Parma— 7 p.m.
Euclid vs. Austintown Fitch at Euclid— 7 p.m.
More divisional brackets here . Good thing the games weren't last night. On Thursday, Cleveland had record-setting rainfall for November 1 with 2.12 inches, breaking the old record of 1.44 inches in 1921.